Why? Because the marginal buyer not only determines price levels, but also their stability and degree of volatility. The behavior of the marginal buyer, as well as the degree of competition for his/her "top dog" spot, sets the prices of nearly every asset class held by today's investors. This example contains several important elements for price-setting. First: the marginal buyer's last bid is what ends up setting the final price. And second: the intensity of competition determines how high the marginal buyer's bid will go (if no one else was willing to offer more than say, $10 million, it's unrealistic to expect that the marginal buyer would have still put in a bid as astronomically high as $106.5 million). Now imagine what would have happened if our marginal buyer above hadn't shown up for the auction. Maybe he got stuck in traffic, or decided he'd rather own a tropical island instead of a wall hanging. How much would the painting have sold for then? It would have sold at a price lower than the losing bidder's last offer. Without our hero in the room, the losing bidder would have become the new marginal buyer. And without the threat from a competitor with deeper pockets, it's quite likely our new marginal buyer would have been able to secure the painting at a substantially lower price. The takeaway from the above is that prices are set by two things: the upper limit that the marginal buyer is willing to pay, and how intensely the competition from other buyers pushes him towards that limit. This is just as true for stocks and housing as it is for fine art. And we're now seeing some concerning signs that the marginal buyers, as well as their competitors, are beginning to go on strike across those asset classes. And as for the marginal buyer, it's increasingly looking like that role is being filled today by the central banks instead of from a wide pool of institutional and retail purchasers (as a proof point: the Bank of Japan now owns over 60% of its nation's ETF market). Putting aside for a moment what an abomination this circumstance is to free and fair markets, having prices set by a central bank is a huge threat to price stability. Why? Because no one else can compete with an entity able to print an infinite amount of thin-air money at will. The gap between what a central bank is willing/able to pay vs the next marginal buyer is tremendous; so if the central bank ever pauses its buying, prices can drop precipitously. In a related vein, observe how the historic stick-save the S&P experienced from March of this year onwards corresponds to a sudden and massive ramp-up in net liquidity by the central banks. 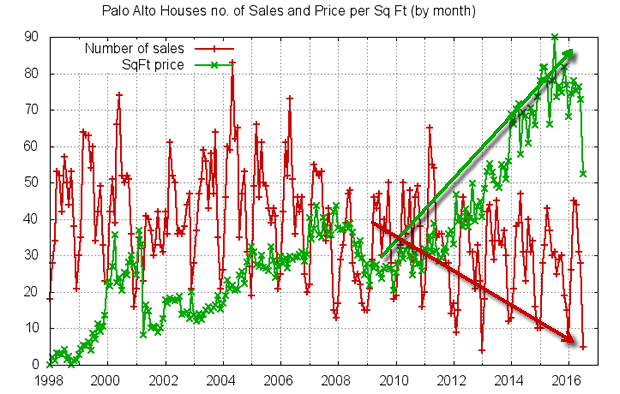 The Housing Market: Poised For Another Crash? This recklessly swift return to bubble heights is being indirectly driven by the same central bank money printing we see in stocks. The liquidity of new capital flooding across the world is seeking a return as well as safety. At this point, the US is one of the few markets offering both positive stock returns and (barely) positive interest rates. So tons of overseas money is flowing in. In popular housing markets like San Francisco, Seattle, Manhattan and Vancouver, the marginal buyer over the past half-decade has largely been foreign, looking to get his cash away from the market and confiscation risk of his native country (I've written often about the impact that the wave of over-asking-price, all-cash offers has had on Silicon Valley, where I lived until recently). Again, the key question is: What will happen if that current marginal buyer disappears? This is not an academic question; it's a very real risk in these markets. Countries like China are tightening their capital controls, making it harder and more punishable to get money over to the US. Good luck collecting from the Chinese oligarch buyers.... or even finding them. But the most dramatic impact will be on future transactions. With the soaring uncertainty about the future rate of home appreciation, and the availability of "greater Chinese fools", buyers will be far more pessimistic and cautious about paying the asking price, or engaging in the kinds of ridiculous auctions profiled here before, such as that of a house valued at $16 Million, selling for $68 Million "In 7200 Seconds." Quoted by FP, Dan Morrison, chairman of the Real Estate Board of Greater Vancouver, said he’s heard of instances of Canadian buyers and sellers who backed out because of the uncertainty in the market. Philipp said one of his offices reported four cancelled deals as a result of the tax, while another reported five failed transactions on Friday alone, with one directly tied to the tax. “I’m getting people coming to our open houses saying, ‘this means the prices are going to come way down,’” said Re/Max realtor Dave Vallee. Vancouver Housing Market Implodes: Average Home Price Plunges 20% In 1 Month - "The Market Is Devastated"
Zolo, a Canadian real estate brokerage, keeps track of MLS home sales in real-time and reports prices as an average rather than the “benchmark price” used by the REBGV. It currently shows a major correction underway in most Metro Vancouver markets. According to the website, the City of Vancouver currently has an average home price of $1.1 million, down 20.7% over the last 28 days and down 24.5% over the last three months. The average detached home is $2.6 million, down 7% compared to three months ago. Note how the sudden disappearance of the marginal buyer can set off a vicious downwards chain reaction, as it exposes how far prices must fall to become affordable to the next marginal buyer. And, of course, in a correcting market, few want to attempt to catch a falling knife -- so the potential population of marginal buyers shrinks as they sit on the sidelines waiting for the carnage to abate. That's the main point of this article: the marginal buyer can evaporate faster than you think. That is the nature of an asset bubble's unavoidable destiny to "pop". As an investor in a market this full of over-inflated asset bubbles, the prudent move is to hedge. "Hedging" is the practice of allocating a minority percentage of your investments to safer or inversely-correlated holdings relative to the majority of what's in your portfolio. Simply increasing the percentage of your portfolio held in cash -- particularly during times of apparent overvaluation, like now -- is an easy and practically risk-free hedging step that anyone can do. In our guide How to Hedge Against A Market Correction (free executive summary; enrollment required for full access), we explore the standard range of hedging techniques that are commonly used to offer portfolio protection and/or upside during a market downturn. These include stops, inverse and leveraged securities, shorting, options, and futures. Even if you ultimately do nothing, at least make that a calculated decision. Don't put yourself at risk of being one of the millions who will look at their statements after the next market correction and lament: Why didn't I consider protecting what I had? The imagery of the auction where that one last rich guy placing the final bit that set the "market price" was very clear. I can see how a central bank could continue to fill the shoes of that one last rich guy hiding the fact that there were no more rich guys willing to pay that last high price any longer. And the Bubbles chapter from the crash course was a very very good review. I had forgotten how clear it was. Great article Adam. Can't argue with the charts, but in a command economy fundamentals matter less. My guess is that the FED and others in power will keep the ship afloat until the election, because to do otherwise would hurt their chosen candidate. Any black swan event between now and November, and it's time to short the ITB. Adam, great article and of course very logical. I do have one question: Let's say you bought at the exact top of the market; or stated differently you were "The last marginal buyer." In a very short period of time the house you bought for a million is worth 1/2 million dollars. Assuming you put 3% down, wouldn't you just walk away from the mortgage? This of course would flood the market with more homes causing everyone else to do the same. I would assume the FED would have to write off this debt. But of course, not sure if there is an easy answer to this question. Sure, you could mail the keys back to the bank in that scenario. But that doesn't mean the bank still won't come after you for the mortgage you owe it. As fate has it, someone close to me is going through that situation right now, on a mortgage only 1/5th that value. The choice they're being faced with is that either their future wages will be garnished by the bank to recoup its "jingle mail" losses, or they have to file for personal bankruptcy. Perhaps had this happened back in 2009, when the market was flooded with foreclosures, the bank would have been too overwhelmed to persecute every defaulter. But if you stretch to buy an overpriced home in a bubble market, you're not only gambling on its purchase price sustaining, but that if things go south the bank won't have bandwidth to come after you. Maybe it will, maybe it won't. But you can be sure it will focus its collection efforts on the defaulting $million-dollar properties first. Adam thanks for writing back! Yea, good point. I think it's good to personalize the story. Graphs and data are great but think of the guy in Vancouver who has a descent job, a wife and a baby who just wants a modest home. His options are rent - which is probably unaffordable - or buy a home which will rapidly fall in value. My wife, son and I currently rent a 800 square foot apartment that is priced about 25% higher than mortgage plus taxes. But giving the circumstances we feel its the right choice. I guess everything must reset or we are all at the poverty level irrespective of our incomes. Thanks again for taking the time to write back - I'm a big fan. Zero yields have distorted global markets to such a degree, it’s hard to know what the “real” price of anything should be except as a business proposition, i.e. does it generate a net profit after expenses. If someone is buying an asset to participate in the appreciation that comes with rising prices, that's an iffy proposition, as any decline in price makes it a poor investment. But if the asset yields a net return after expenses, a decline in price doesn't really affect long-term holders who weren't seeking appreciation as their "way to make money." The problem with bubbles is the price reaches a point where it's almost impossible to earn a net yield due to higher expenses resulting from higher debt. That said, a pathetic net yield of 3% looks good in a world with negative yields and 30-year Treasury yields of 2.6%. We also have to factor in the expectations of huge declines in the purchasing power of currencies. Chinese buyers in B.C. were willing to pay insane sums to lock in ownership of a currency other than the RMB, which everyone knows must be devalued going forward. What causes a bubble to pop? Who knows? It’s always as if a silent dog whistle was blown that only dogs and marginal buyers can hear. People are always left scrambling for answers, and struggling to explain exactly what caused the nosedive to begin. In prior cycles it helped to look where the action was. In housing bubble the action was finally concentrated in the truly well-named ‘marginal buyers’ the inhabited the bottom of the subprime barrel. They were the last available patsies to be sucked into the game, so watching for a rollover in the subprime frenzy was the right thing to do. That’s where I focused both my mental attention and shorting activity. But now…where do we look now? It’s important to realize that the Fed’s bubble blowing this time has been the most extraordinarily unbalanced in all of human history. The money they printed up was injected straight into the main arteries of the speculative financial world. That is, it went directly to the tippy-top, and we can detect that in the obscene wealth gains logged by the 0.1%. So this time, for this bubble, where do we look? Why, we look at the very tippy-top of course. That’s where we’ll most likely first detect a tightening which, I must re-stress, is not a financial condition as much as it is a psychological shift. Bubbles are irrational. They spring from the amygdala, not the cortex. Fear and greed and other base emotions rule, not cold logic and calculable returns. The summer crowds are dense in Aspen. Sales tax revenues are soaring. Lodging occupancy is high. So why is Aspen’s high-end real estate market — one of the most robust in the country, with dozens of options for buyers ready to spend more than $10 million — in its first-ever sustained nosedive? High-end sales that fuel Aspen’s $2 billion-a-year real estate market are evaporating, pushing Pitkin County’s sales volume down more than 42 percent to $546.45 million for the first half of the year from $939.91 million in the same period of 2015. Aspen is historically immune to the macro temblors that rattle most real estate markets. Yes, it slid in 2009 after the economy collapsed, but not by much. And it rebounded spectacularly, reaching pre-recession levels in 2012 and then getting back to setting records in 2014. 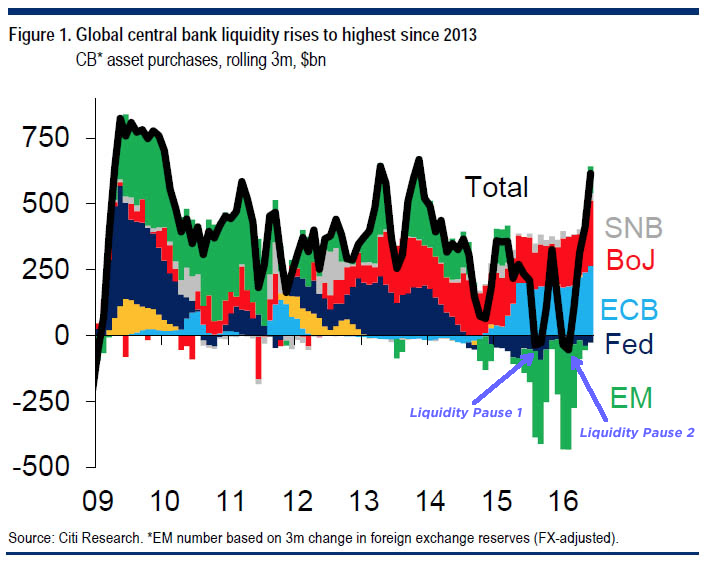 Given that Adam’s chart above shows that the central banks now have all the evidence they need that these “”markets”” fall apart the second the central banks stop flooding them with ‘liquidity’ (really, thin-air, helicopter money) what can we presume? First, that they know all too well that the tippy-top marginal buyers are nervous if not in retreat. Second, because they know that the only thing holding these Franken-“”markets”” together is deceit and helicopter money we can count on them doing precisely, exactly more of the same right up until it utterly blows up on them. The longer this goes, the more apocalyptic I become. But I am also happy for the extra time. It's a good news, bad news situation. 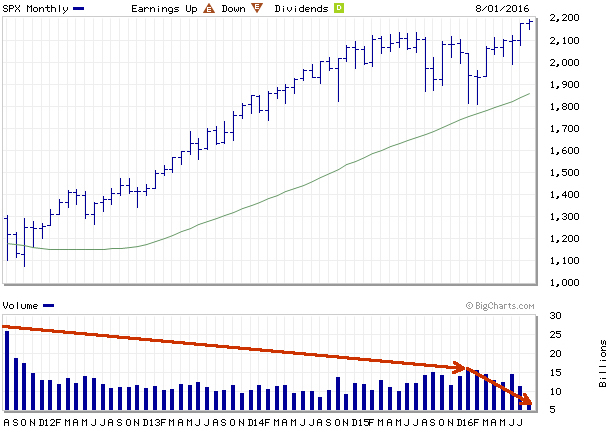 What was going to be a painful adjustment in 2009, has now morphed into a very scary sort of possible break down. Like Venezuela, but all over the globe, in nearly all locations. Thanks Ben & Janet! That’s just what happens when you grotesquely distort the money system. Some days I think that the Fed has evil genius plans. The rest of the days I am certain they are just self-deluded academic nitwits. More and more I am leaning towards the latter, although I should point out I take zero comfort from either circumstance proving true. I too like the "marginal buyer" viewpoint. Because of the leverage involved and the relatively small turnover as a percentage of total stock, its much easier to see in housing. And that 15% tax, applied long after the bubble moved into full swing, is having an amazing effect. Power to tax is the power to destroy. To sort out who might the marginal buyer be in equities, and when they might vanish, it could be useful to think about who is buying and why. the PPT, whenever a dip of consequence occurs, because "that's their job"
Many of these buyers are driven into the equity market indirectly - by the flow of money from central banks into bonds. In some sense, its displaced money. Former bond owners are now buying equities as a replacement instrument. When the ECB buys bonds, indirectly, US equities get bought. That's probably true with BOJ also. As long as the yield remains, then money-printing displacement should lead to continued buying of US equities. If bond-buying stops, the flow from displacement buying will stop also. If US rates rise, that signals "the party is over" and it also makes equities relatively less attractive; "return-chasers" and market timers will bail out. if companies stop buying back stock via debt, because aggregate debt loads just get too large. if a recession occurs, that will start to impact dividend payouts. if the dollar has a major downturn, that impacts willingness of foreigners to hold US assets; they will experience currency losses even if equity prices do not move. How can we analyse where we are in the Bubble cycle with PMs? How many margin buyers will there be for the next peak, what will entice them and deter them? $1Billion dollar holiday home anyone? "...so if the central bank ever pauses its buying, prices can drop precipitously. Hmmm, why does that sound familiar? Oh, that's right...that's exactly what happened last August, and again at the beginning of 2016 when the S&P went into violent free-fall. Note how those plunges line up exactly with the two moments over the past year when the world central banks' liquidity spigot was at its lowest..."
1) From a policy perspective what caused liquidity to dry up in August and early Jan/Feb? I understand that was the approximate time China came out with a shock devaluation and (Aug) and Fed raised rates 0.25% (Dec) but how did these events affect global liquidity? 2) Also, second question: Are there any limits to central bank liquidity? I know BoJ and ECB are at negative rates but what's stopping the BoJ from owning 80%+ of the stock market ETFs? I understand liquidity is drying up in Japanese Govt Bonds as banks are running out of bonds to sell the BoJ as they're hitting collateral minimum requirements. I'm just trying to understand how these mechanisms work. Thanks again for the great article!